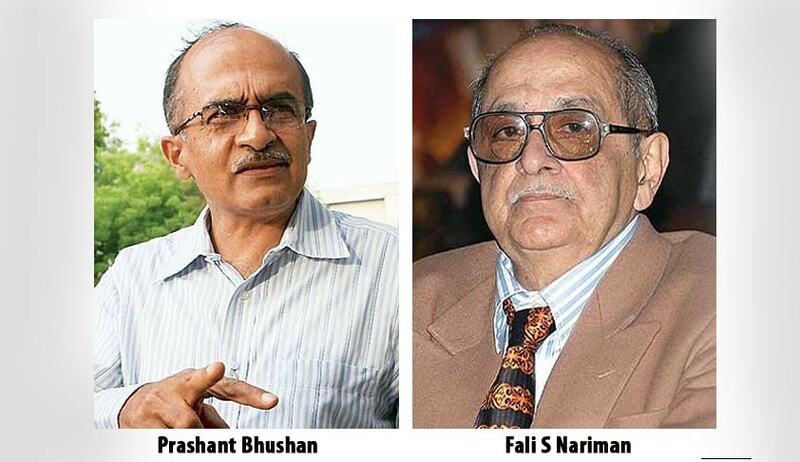 Perturbed by news reports rebutting his claims before the Supreme Court on functioning of the NGO, Centre for Public Interest Litigation (CPIL), Mr. Prashant Bhushan has written a letter to media including Firstpost, Times of India and Mail Today , stating that the claim that Senior Advocate Fali S. Nariman vets CPIL petitions before they are filed has been misreported. The clarification email was sent hours after Mr. Nariman refuted the claim in a letter written to Supreme Court Secretary General Ravindra Maithani. Mr. Nariman had written, “It is true my name has been on the committee of CPIL almost since inception, but no PIL filed by CPIL has ever been seen by me, much less scrutinized by me.” He had requested Maithani to bring the letter to the notice of the CJI. Mail Today’s clarification published today said : In the report-‘Bhushan’s PIL centre’ draws CJI’s wrath’ published on page three of Mail Today (January 13) it was wrongly mentioned that noted lawyer Prashant Bhushan had submitted before the Supreme Court that senior lawyer Fali S Nariman was part of the sub-committee which decides on PILs to be filed by NGO Centre for Public Interest Litigation. It is made clear that Nariman, a founder member of the CPIL is only a member of its Governing Council which has authorized a sub-committee to decide on the PILs to be filed. Nariman is not part of the panel which vets the PILs and also did not scrutinize the petition against Reliance which was being heard by the court. We regret the error". In the clarification email, Mr. Bhushan stated that the “incorrect reporting” has caused serious confusion and damage to the reputation of CPIL and himself, and went on to explain CPIL’s stand before the SC. “I had stated that there is a sub-committee of 5 advocates: Mr. Anil Divan, Mr. Shanti Bhushan, Mr. Colin Gonsalves, Ms. Kamini Jaiswal and myself who decides on the PILs to be filed by the society. I had also mentioned the names of certain senior advocates like Mr. Fali S Nariman who are the founding members of CPIL and are also part of its governing body. Your paper has misreported the court proceedings and has stated that Mr. Nariman is part of the committee which decides on filing of PILs. That is not what I had said and it not correct,” he wrote. Mr. Bhushan also laid light on the functioning of CPIL, stating that during a meeting convened on January 4, 2013, the Governing Council of CPIL, of which Mr. Nariman is a member, has authorized the sub-committee to decide on the PILs to be filed. The Council had also reaffirmed the appointment of Ms. Kamini Jaiswal as Secretary of the Society, mentioning that she was authorized to sign the Vakalatnama and affidavits on behalf of the Society. “She can act to file cases after consulting the aforesaid subcommittee either telephonically or by emails. We further confirm and resolve to authorize Kamini Jaiswal and Prashant Bhushan to decide whom to engage for appearing in and arguing cases before the courts, in consultation with the President, Mr. Anil Divan. We confirm and ratify all acts done by them in filing and pursuit of PILs filed by them on behalf of the society,” the resolution further stated. The saga began earlier this week, with CPIL having to face some unconventional questions from Chief Justice of India regarding the source of information and scrutiny of it before filing the PILs. The Bench, comprising Chief Justice T.S. Thakur, Justice A.K. Sikri and Justice R. Banumathi apprehended that people with vested interests could misuse the credibility enjoyed by the CPIL in order to settle scores in their business rivalry. “When we entertain your petition, you must establish a credible mechanism of scrutiny. People of eminence should apply mind and certify that such a mechanism inspires confidence. We want to make sure that a petition filed by CPIL has gone through a particular process and is genuine,” it had said. “Prashant Bhushan, you have an image of a crusader. But can you become the centre for public interest litigation? Can the system be taken for a ride in such a manner? We cannot allow this. We must be satisfied that you have a committee which scrutinizes the complaints and allows only genuine ones to be converted into public interest litigations,” the Bench was further quoted as saying. You may read the LiveLaw article here. In the report published on your website on 12.01.2016, you have reported the observations made by the Chief Justice of India made during the hearing of petition filed by Centre for Public Interest Litigation (CPIL) against the grant of voice telephony to Reliance on 4G spectrum at 2001 price. I was the advocate for CPIL in the said petition wherein CJI raised certain queries regarding the functioning of CPIL. In response to the said queries, I had explained the mechanism and system followed by CPIL for deciding on the PILs that are to be filed in court. I had stated that there is a sub-committee of 5 advocates: Mr. Anil Divan, Mr. Shanti Bhushan, Mr. Colin Gonsalves, Ms. Kamini Jaiswal and myself who decides on the PILs to be filed by the society. I had also mentioned the names of certain senior advocates like Mr. Fali S Nariman who are the founding members of CPIL and are also part of its governing body. Your paper has misreported the court proceedings and has stated that Mr. Nariman is part of the committee which decides on filing of PILs. That is not what I had said and it not correct. The Governing Council of CPIL of which Mr. Nariman is a member has authorized the sub-committee to decide on the PILs to be filed. In the meeting dated 4/1/13 attended and signed by 11 members of the governing Council including Mr. Nariman, it was resolved: That we hereby resolve that in accordance with Rule 4 (b) (1) of the Rules and Regulations of the Society, we continue and appoint the same Sub-Committee of the following members which was appointed on 4/5/03 to decide the petitions that will be filed on behalf of the Society in any court of the country. Mr. Anil Divan Mr. Shanti Bhushan Mr. Colin Gonsalves Ms. Kamini Jaiswal Mr. Prashant Bhushan We also reaffirm and continue the appointment of Ms. Kamini Jaiswal as Secretary of the Society who is authorized to sign the Vakalatnama and affidavits on behalf of the Society. She can act to file cases after consulting the aforesaid subcommittee either telephonically or by emails. We further confirm and resolve to authorize Kamini Jaiswal and Prashant Bhushan to decide whom to engage for appearing in and arguing cases before the courts, in consultation with the President, Mr. Anil Divan. We confirm and ratify all acts done by them in filing and pursuit of PILs filed by them on behalf of the society.” Mr Nariman has not been a member of the sub-committee and therefore he had not scrutinized the petition filed against Reliance. Moreover, I had never stated that he had done so. However your incorrect reporting has caused serious confusion and damage to the reputation of CPIL and myself. Kindly carry this clarification on your website as prominently as your news report". That we hereby resolve that in accordance with Rule 4 (b) (1) of the Rules and Regulations of the Society, we continue and appoint the same Sub-Committee of the following members which was appointed on 4/5/03 to decide the petitions that will be filed on behalf of the Society in any court of the country. Mr Nariman has not been a member of the sub-committee and therefore he had not scrutinized the petition filed against Reliance. Moreover, I had never stated that he had done so. However your incorrect reporting has caused serious confusion and damage to the reputation of CPIL and myself. Kindly carry this clarification on your website as prominently as your news report. Read the CPIL's resolution here.